Sascha was born into a litter of 10 pups. Congratulations on your newest addition to the family. And she is drop dead gorgeous!! 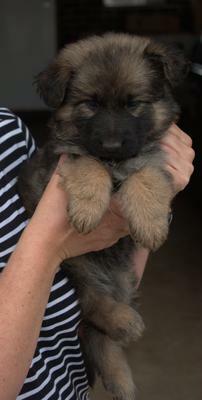 A beautiful German Shepherd puppy if I've ever seen one!! Sascha is going to be a big baby too it looks like judging from the photos! And a litter of 10! Wow, I know momma will be glad once they have all been weaned off her, bless her little heart. Keep her up to date on all her shots and wormings, get her into a training class when she gets a little older, start on her socialization as soon as you get a few shots under her belt and you should be well on your way to a long and wonderful relationship. I wish you nothing but the best with her. 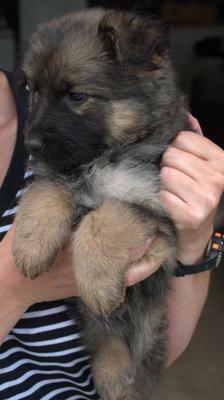 Maybe you can send us some more German Shepherd puppy pictures and an update on how she is doing in a few more months. We would all love to see how she is progressing. GSDs rule!! Your Sascha is so adorable and I love her name! Enjoy this time precious time and it so important with her bonding, training and teaching but make sure she knows who the boss is because female Shepherds like my Mia was a little bossy when she was a pup. German Shepherds are amazing, it doesn't matter if they are females or males, just because she is "girl" don't think she is weak; the are the same especially when it comes time to be Protective, Mia has scared a couple of uninvited guest. Take care of your Sascha and she will take care of you! To David Craker of Rupanyup, Victoria Australia. U my friend are the lucky DOG! Sascha is lucky to but there are a lot of us that would love to be U at the moment. Your puppy is precious. Treat your new best friend as a family member and be patient in the house breaking. NO DOG BOXES!! Sascha needs to be a live in pup. My email is stanstey1@comcast.net. I would be honored if you could send pictures as Sascha grows up. Then again I'd like to learn a little bit about Australia.